When your overhead spinner starts acting up, follow these moves to restore the quiet—and the cool. Even in the age of central air, ceiling fans still have their lofty place. The welcome breeze they provide evaporates sweat and contributes to the cooling effect every home calls for in summer. After much use, though, you might start to hear it audibly rock with every rotation. If yours seems out of whack—wobbling weirdly, making a racket—fret not. The noise of a wobbly ceiling fan doesn’t have to disrupt your peaceful day or force you to go out to buy a brand-new fan just yet! The fix is in. Keep reading for the quick steps it takes to balance a ceiling fan. STEP 1: Clean all dust from the fan blades. 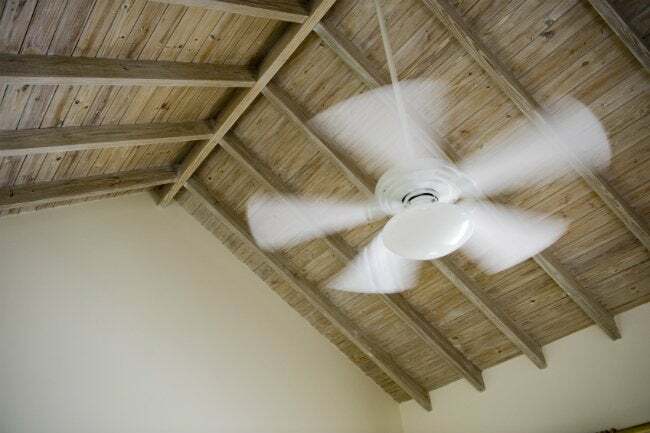 Banish dust, perhaps the most common cause of a wobbly ceiling fan. You’ve got an excuse—it’s easy to forget to look up when cleaning—but neglect can cause big-time buildup. Dust settles unevenly on the blades, making some heavier than others and throwing the entire enterprise off-balance. It’s likely that you’ll need more than a swipe of a feather duster at this point, especially if dust has hardened. So, with the fan off and the blades completely still, climb the ladder and take a damp rag, towel, or pillowcase to clean both sides of each blade. Then dry with a fresh rag and give the fan a spin to see if the problem’s been solved. STEP 2: Inspect for loose screws on your fan’s base. Still got the shakes? The next most likely culprit is a loose screw at the base, where the blades meet the flywheel. Climb back on the ladder and give each screw a clockwise turn with your screwdriver. If you tighten any loose ones, you may have done the trick. Get down from the ladder and flip the switch to see. If so, remember to check the screws every few months to avoid a recurring issue. If not, proceed to the next step. STEP 3: Compare the alignment of fan blades. 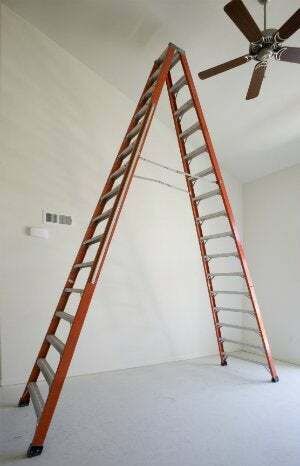 If blades continue to misbehave, it’s up the ladder again to check their alignment. Using a ruler or yardstick, measure precisely from the ceiling to the blade at the same three points on each: close to the flywheel at the center of the fan, about halfway down the length of the blade, and at the tip. If any of the numbers don’t match up, gently bend the blade holder manually up or down to straighten. Just take care not to apply too much pressure—you don’t want to break a blade or holder. STEP 4: Even out the weight of individual fan blades using a balancing kit or a few pennies. …using a ceiling fan balancing kit. A storebought kit (available from manufacturers directly as well as home improvement centers, like this Harbor Breeze kit at Lowe’s) typically costs only $3 to $10 and contains all you need to balance a ceiling fan: a few slim weights as light as ½ gram apiece as well as a means to attach them to fan blades. Follow the balancing kit’s instructions for finding the wobbly fan blade; this usually involves attaching a plastic clip (included in the kit) or temporarily taping one of the weights to the top of the blade in question, centered along the rear edge. Turn your fan onto the medium and then high settings to see whether the weight made the wobble less noticeable or worse off. Repeat this test on each blade to ensure you find the one that could benefit the most from additional weight. Then, test a few more times by moving the clip inward toward the fan base and outward toward the edges of the room to find the best place to attach your weights. When you have discovered the right combination, place and adhere the appropriate amount of weight to the problematic blade according to the kit’s instructions. …using a penny. While a packaged kit tends to take out the trouble, you can still opt save a couple of bucks and try the penny method. Using painters’ or masking tape, firmly attach a penny to the top of a blade, close to the center, and then check the fan’s functioning. You may have to do some troubleshooting to determine which blade needs the extra weight and exactly where it should go, so be patient, starting from the center of each blade and working your way out a few inches at a time. Once you’ve found a placement that relieves the issue, replace the tape with a few drops of superglue. Allow glue to dry completely before giving the fan a final spin to make sure the penny is performing. If wobbling persists but it’s not as pronounced, one or two additional, perfectly placed pennies should do the job. Keep it up through trial and error until you’ve found the right locations, and then glue the pennies on permanently. Still confronting a fan frustration? Blades may have gotten warped due to humidity or age. Before you scrap the whole apparatus, look for a set of replacement blades, which you can find for under $10 each. Then sit back and enjoy the downwind!